Deborah Lyons (BA’71) has been appointed Ambassador to the Islamic Republic of Afghanistan. 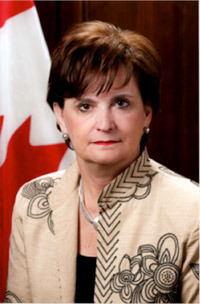 Ms. Lyons has been serving as the deputy head of mission at the Canadian embassy in Washington, D.C. since September 2010. She joined the Department of Foreign Affairs and International Trade Canada in 1999 where she held various positions, such as director, international finance; director-general; and assistant deputy minister for strategic policy and planning, serving also in Tokyo as the commercial counsellor for high tech industries. She has also held prominent positions with the Atlantic Canada Opportunities Agency, Department of National Defence, and Natural Resources Canada. After completing her bachelor’s degree with honours in biology at the University of New Brunswick in 1971, she was a successful small-business owner before joining the federal government. Ms. Lyons is from Chatham, New Brunswick.